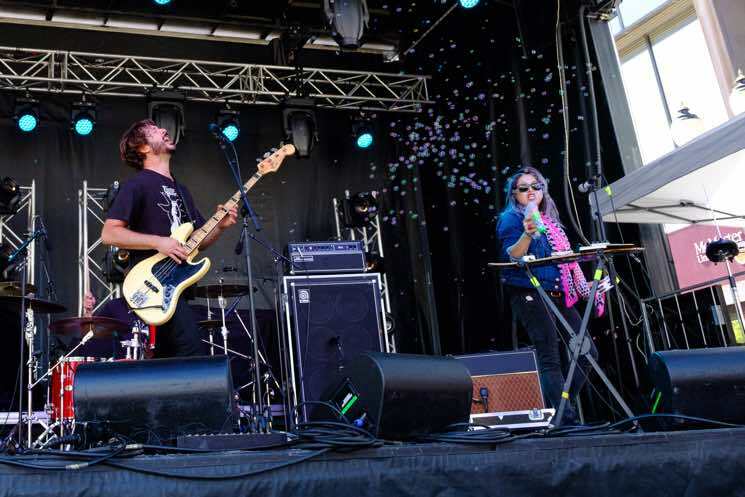 Launching into day two of this year's Supercrawl with a furious explosion of noise, Toronto rock outfit Dearly Beloved quickly caught the attention of passersby. Opening track "Rip," taken from their most recent release Admission, immediately highlighted duo Niva Chow and Rob Higgins' ability to tastefully push their enormous sound to its limits. Assisted by a proficient guitarist and drummer, Dearly Beloved abided by the title of their first song of the afternoon and ripped through their performance with palpable energy. Higgins' frenzied bass playing was powerful, holding down each track with a roar while Chow's use of a theremin was the most interesting part of the set to witness. The duos contrasting vocal stylings — Higgins' raspy growl and Chow's shrill wails — effectively complemented one another. Dearly Beloved proved there's nothing better to kickstart your day than a deafening rock show.